It was a warm, cloudy morning when my family and I lifted off out of Midway onboard our 737, bound for Orlando International at the beginning of the Labor Day weekend. 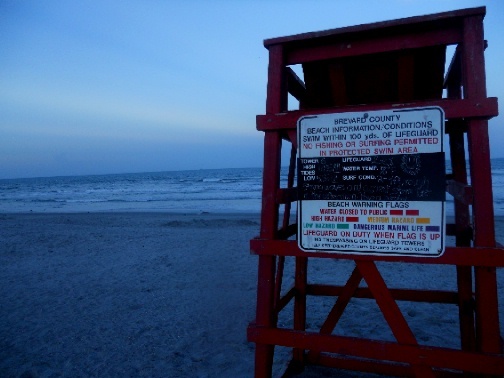 We had reservations for Disney World later the following week, but our first stop would be Cocoa Beach. After a half-hour wait at the rental car counter, we loaded up the luggage and were soon driving out of Orlando along the 528. It’s a straight road most of the way to Cocoa, until it turns into part of the A1-A and heads out over the water on a pair of long causeways, just before you reach Port Canaveral. There, the big cruise ships are almost always in port, loading up passengers for 3 and 4 day excursions into the Caribbean. We followed A1-A south, and about an hour after leaving Orlando found our hotel. 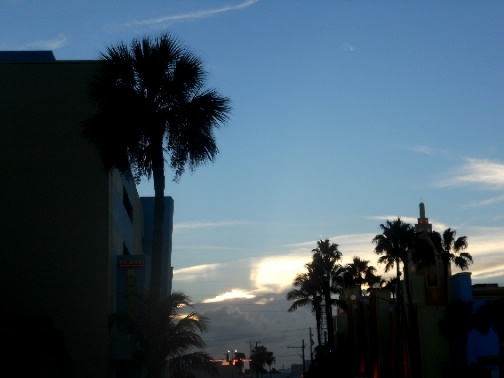 As usual, we stayed at the Four Points Sheraton, just a couple of blocks from the beach in downtown Cocoa. The Atlantic rollers on the Beach that afternoon were higher than I remembered from previous trips, but that made swimming and body surfing much more exciting. Quite a few locals said it would be crowded this weekend, and I suppose it was; but, compared to an August weekend at Oak Street Beach in Chicago, it wasn’t that bad. The shoreline at Cocoa Beach is impressive. I felt I could walk for miles along the sand and not come to the end of it, and so visitors could really spread out. The kids were soon lost to the waves and seashells, with my Wife tagging along behind to keep them from getting lost. You could quickly pick out tourists like myself, painfully pale and liberally dosed with sun screen. I envied those lucky residents who could hop in their cars, park for a few quarters in the meter, and head down to the sea whenever they felt like it. After an afternoon in the sun and sand, we headed back to the Sheraton for some dinner and shopping. 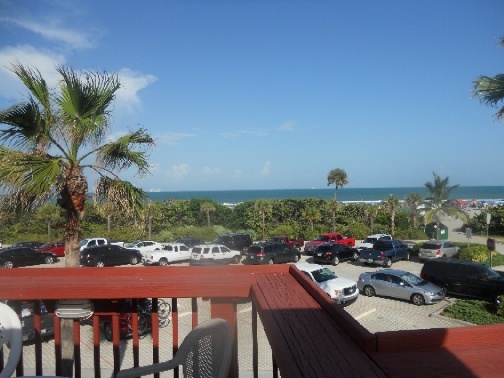 The Cocoa Beach Surf Company makes up about half of the Hotel, and includes the Shark Pit Bar & Grill and a surf board rental shop. I rented a body board the next morning, and we were back at the beach around 9 a.m., to soak up more rays and do some serious body boarding. I’m the first to admit that I have no talent or skill in this area, but the couple of times I was able to ride a decent wave all the way into the shallows made all of my efforts worthwhile. There’s a joy in it, that makes all those times getting knocked down seem less important. We headed back to the Hotel when they closed the beach for half an hour around noon, due to a shark sighting, or so the lifeguard told me. We grabbed lunch, and still had a long afternoon of fun in the sun before finally calling it a day. Later that afternoon, after a short walk from the Hotel along a boardwalk near the beach, we stopped into Captain J’s, a bar and grill with upper deck seating overlooking the ocean. 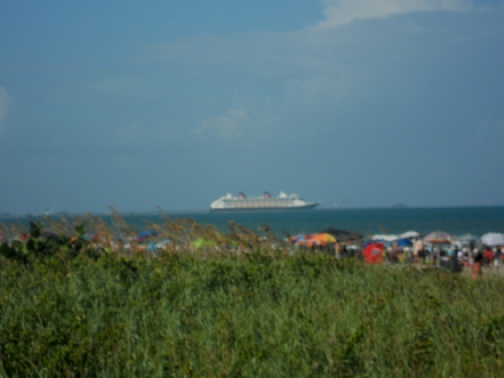 Good food and service, the main attraction is watching the Disney, Carnival, and Royal Caribbean cruise ships as they head out to sea. That Sunday night, the ships appeared in line heading southeast, and we watched as they sailed out of sight into the vast Atlantic. I walked the beach alone that evening for the last time: listening to the sound of the surf as they sky darkened, looking at the lights out to sea and those of the resorts on land, and enjoying my solitude among the last few beach combers. The Moon was quarter full when it appeared that evening, and almost directly overhead. I could almost feel the presence of those astronauts who left from nearby Cape Canaveral on their Moon missions. Did Collins, Aldrin, or even Armstrong walk these sands, looking up at this same Moon mere days before they walked on it for the first time? I could well imagine them here. Toward the end of the evening, I spotted a couple of old men in front of a lopsided tent, enjoying a few beers as the sun set. As they talked, joked, and reminisced, I wondered if they might have the right of it, just sitting there on the beach in Florida without an apparent care in the world. Maybe this lifestyle would grow routine, but I saw a lot of enthusiasm on the faces of the surf boarders, skim boarders, and body boarders – old and young alike. I wondered what it would be like to live out the lyrics of those old Beach Boys songs, if even for a little while. I would be driving to Orlando and Disney World the next day, and I knew, in the back of my mind, that my law practice in cold Chicago was waiting for me when I got back home. But part of me waits on that beach, walking the sand, watching the sun set and listening to the waves. And maybe having that cold beer. 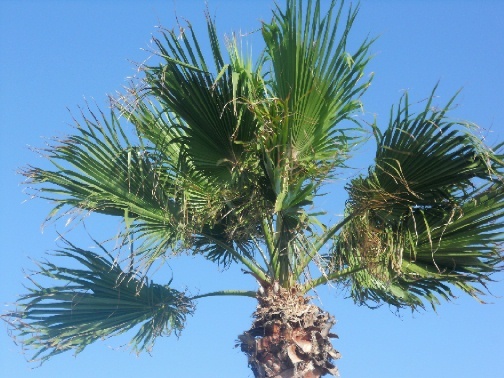 This Post was posted in Travel and tagged beach, beachside resident, cocoa beach, Family Travel, family vacations, florida, nostalgia, Pete Murphy, space coast. Bookmark the permalink.